The val Fiorentina and its Civic Museum Encapsulate a Quintessential Dolomite Microcosm. The val Fiorentina is situated a little distance away from the resorts of Alleghe and Caprile and the Valle di Zoldo, to which it is directly linked through the Forcella Staulanza pass. Historically, the valley covers an area where several boundaries have met – and that has had extremely fascinating consequences in terms of its cultural aspects, as this was a location where a lot of ‘contamination’ would happen, especially so in the Ladin-speaking communities of Colle Santa Lucia –which belonged to Tyrol until 1918 – as well as nearby Cortina and Livinallongo, both accessible through the Falzarego and Giau passes. 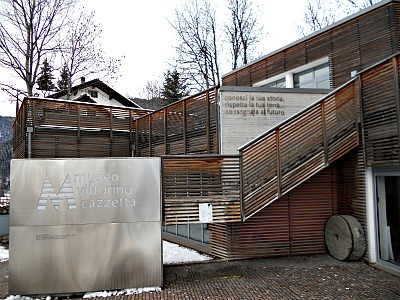 The Civic Museum “Vittorino Cazzetta” (whose entrance is pictured above) is situated in Selva di Cadore, in the Dolomites’ heartland: a location dominated by the presence of important massifs such as Pelmo, Civetta and Marmolada. The area is quite secluded but at the same time easily reachable, and – geographically speaking – it is part of Agordino, although culturally speaking it belongs to Cadore. The village of Selva di Cadore is also extraordinarily well-preserved, and this allows to appreciate the innumerable man-made interventions that have led to the construction of the current landscape, as we still see it today. The Museum is situated on the main road that crosses the whole val Fiorentina, just outside Selva di Cadore; it is connected through ancient itineraries to other historical settlements in the valley and to the network of the “Vie del Ferro” (‘Iron Ways’) – the most important of which was also known as “Strada della Vena”, directed northbound towards Andraz Castle (see Livinallongo) and San Martino in Badia/St. Martin in Thurn. The Museum is hosted in a beautiful modern building in ‘Liberty’ style dating to the beginning of the 20th century, recently renovated with the aim of creating spaces for visitor services, temporary exhibitions and other cultural activities; in particular, on the ground floor, there is a spacious room that opens up with large glass windows on to the surrounding landscape, taking in the magnificent peaks of the Dolomites; the flexibility of the architectural structure allows for a full, autonomous use of all its different spaces, and the organization of the different functions within them. The visit route is characterized by the indigo blue of the surfaces and the transparency of the display cases: these are organized like evanescent casings that allow the best vision of both the finds and the diorama, also from above; this is all geared at facilitating the presentation of the collection into a coherent story, thus providing the visitor with the best possible experience. In synthesis, the visit route to the Museum is articulated between the first and the second floor in the following way (all these features will be explained in more detail below): an atrium, that presents the general characteristics of the val Fiorentina, the history of the Museum and of Vittorino Cazzetta, to whom the Museum is dedicated; the collections proper, which begin with an introduction to the geologic and paleontological history of the Dolomites, with a particular focus on the iron and onyx trade. The visit to the geologic and Pre-historic section starts with an expanation board and a photographic image illustrating the geographic outline of the val Fiorentina and of all its most relevant sites, together with numerous fossil finds, displayed in cases in front of a reproduction of the Dolomite boulder from Pelmetto – the location where the famous dinosaur’s footprints have been found – with the individuation of the most significant prints left by these Pre-historic animals; this room also hosts other diorama and casts to help deepening the knowledge of the sites where such extraordinary discoveries were made. From this section it is then possible to reach the rooms dedicated to the Archaeology of the Mesolithic and – at last – the space where is displayed the burial ground of the “Uomo di Mondeval” (‘Mondeval Man’). The first room in this section sets the scene for the area of Mondeval, describing its Pre-historic events; another large diorama reproduces a Mesolithic hut with scenes from daily life, while in the adjacent rooms are exhibited the original finds from the funerary endowment and other drawings that illustrate the burial of this hunter. The burial room is set in such a way as to transmit the emotion of this extraordinary archaeological find; it is enriched with a special design – also in a deep indigo blue – and extended to the floor, where the clear glass case containing the actual burial is located; the last room in this section is dedicated to a multimedia reconstruction of the Mondeval man’s face. These are hosted on the second floor of the building, and to begin with, there is another introductory board showing all the sites of major interest, as an aid to locate them in the territory; in the room just nearby is the cast of the Stele Paleoveneta found at the foothills of Monte Pore, while on the other side are the lithic (rock) remains coming from another site at Mandriz. On the short wall is a vase dating to the Copper Age, also found in Mandriz, and additional information on the archaeological digs. The historic section displays cases dedicated to casts of Roman delimitation stones, and an exhibit of documents and finds related to the mining industry. Two large panels individuate the route of the “Via del Ferro” (‘Iron Way’), and the sites alongside it that hold the most interest from an historic point of view (mines, kilns, fortifications, forges). The visit terminates with a Venetian slab stone that symbolically reminds not just of the great interest that the Republic of Venice showed towards Cadore (mainly because of its natural resources), but also of the extraordinary importance that the mining industry had in itself – all the way from the Paleoveneti to the fall of Venice – for the social and economic development of the val Fiorentina in general and of Selva in particular. The presence of the Museum and the organization of its collections are also somehow detectable from the outside; the peculiar ‘skin’ of the building – covered with the typical larch tiles known locally as 'scandole' – serves not only the purpose of blending the new structure in regards to its surroundings, but also that of signaling a certain degree of symbiosis with the rest of the valley and its natural environment; most likely, the external staircase is the single element that best denotes the new Museum, as it influences its layout, ‘naturally’ orientated towards Monte Pelmo: the mountain that constitutes the focal element and the privileged axis on which the entire structure revolves – exactly in the same way as the valley. The Dolomites – already famous in the past as ‘Monti Pallidi’ – are now a particular portion of the southern Alpine chain known as ‘Sudalpino’, delimited to the west and east by the rivers Piave and Adige respectively. To the north and south the limit is provided instead by two important tectonic structures – the ‘Val Pusteria fault-line’ and the ‘Valsugana fault-line’, respectively. The latter delimits the Dolomites in relation to the Pre-Alps of Veneto, developed to the south and open towards the Venetian plains; the ‘Val Pusteria fault-line’ is instead part of that great ‘Lineamento Periadriatico’ (a major fault-line), which isolates the ‘Sudalpino’ from the rest of the Alpine chain. The univocal characteristic of the ‘Sudalpino’ is that of having been lifted and deformed by processes connected to the Alpine Orogenesis (responsible also for the creation of the Alpine range), but without ever being subject to the metamorphic upheavals that have affected the rest of the Alps; therefore, in the Dolomites in general – and here in particular – we find intact almost all of the Pre-alpine stratigraphic succession. The region registers, however, the metamorphic effects of a precedent Orogenesis – so called ‘ercinic’ – which developed between 350 and 320 million years ago. As an effect of this more ancient Orogenesis, the rocks of the preceding Pre-Permian unit have been variously metamorphosed to form the so-called ‘Crystalline Basement’. This latter formation emerges widely across the Dolomites, and it is covered in ‘discordance’ by the sediments of the Permian-Mesozoic layer. Only locally – mostly on the Ampezzo plateaus – the Mesozoic units are being truncated by a wide erosive surface over which is laid a conglomerate of Oligo-Miocenic age, dated to the same period as one of the most important deformation phases in the entire Alpine range. These have determined a fault-line system that separates in a symmetrical fashion the sedimentary cover from the underlying ‘Crystalline Basement’, thus causing the Dolomite region to take the typical shape of a wide fold, depressed at its centre (it is referred to as a ‘sinclinorio’ in Italian; an inclined slope) and affected by other deformed structures – such as faults and overthrusts, also folded – too. In the val Fiorentina surfaces the classic Triassic stratigraphic succession, typical of the Dolomites, which was deposited between 251 and 199 million years ago. Only on the top of M. Pelmo is present also a carbonate unit which can be referred to the subsequent Lower Jurassic. The Lower Triassic is represented everywhere by the Werfen Formation, which was deposited in a wide marine basin, generally not very deep. During the Middle Triassic, a large portion of the Western Dolomites was tectonically lifted and taken to emerged conditions (‘Dorsale Badioto-gardenese’); in this area surfaces therefore a different succession from the one found more to the east (as in Cadore, for example), which was a basin instead. The val Fiorentina was located at the eastern margin of this ridge (Dorsale), and as a consequence it presents a stratigraphy which is different from area to area. To the west we find a vast erosive surface that rests on the Werfen Formation and determines a wide stratigraphic lacuna; in the NE sector, instead, the succession is more consistent: here two phases of emersion can be registered, but there is also evidence of the presence of deeper basins, which already started to develop during the Anisian. In the Ladinian we find a new deep basin, coexisting with the grand systems of carbonate platforms (as in the Marmolada, Cernera, Verdal and Piz del Corvo). In the Upper Ladinian the area is directly involved in a great sub-marine volcanic phase, which shatters the entire landscape; because of this upheaval, the great basin tended to fill up, leaving room, however – in the subsequent Lower Carnian – for a new generation of carbonatic platforms (as in the Lastoni di Formin, Averau, Nuvolau). In the Upper Carnian the residual basins were then filled by a new sedimentary unit (‘Dürrenstein Formation’), before the area went into definitive and general emersion. This phase is documented by the red continental deposits of the Travenanzes Formation; these are also part of a transition towards another potent carbonatic deposit: the Dolomia Principale (Main Dolomite), in which are sculpted – for instance – the massive banks of the Croda da Lago, Pelmo and Civetta. All these complex phenomena – just sketched here – will be explained in greater detail below. Minerals are being extracted from the mountains of the val Fiorentina since the depth of the Middle Ages: as a matter of fact, as early as 1177 the emperor Frederick Barbarossa appoints the convent of Novacella/Neustift (in South Tyrol) with the right to exploit the minerals extracted from the Fursil mines. The minerary district is situated within the Triassic vulcanites on the southern slope of Monte Pore; the extracted mineral was called ‘syderite’ (an iron carbonate), and it is associated with manganese oxides. The iron that was obtained out of working the raw material was quite precious, and it was particularly apt for the realization of the so-called ‘white weapons’ (swords). The mineral was extracted in numerous galleries, located in particular in the area known as ‘I Vauz’ – a location identifiable today because of the large detritus’ cumulus that can still be seen there. All the ancient mine galleries today are either closed or inaccessible, but – in 1933 – one of the old mines of the ‘Vauz’ area could be explored, and this brought back quite an extensive documentation on the different extraction techniques and how they have evolved over time – until the definitive closure of the mine compound in 1753. In its long history, the Fursil mine has witnessed numerous, contrasting episodes related to the exploitation of its minerals. Squeezed between the Imperial territories owned by the Bishop of Bressanone/Brixen, the ancient rights of the Novacella convent and the claims of the Republic of Venice, these mines lied at the centre of a very complex dispute, the study of which is exemplary in order to understand the history of the region – to which one must also add the ongoing contrasts between the miners from Cadore and those of German origin, summoned by the Bishop. The extracted mineral was treated directly in this territory, where several important plants for processing iron were located (such as in Caprile, Pescul and Zoldo). Under the definitive rule of the Bishops, a preferential route was also traced for carrying the mineral to Andraz Castle, from where it continued its journey towards the kilns situated in the surrounding area and by the Valparola pass. This itinerary, known today as “Strada del Ferro” (‘Iron Way’, or “Strada della Vena”) was recently made accessible again, thus retrieving a fundamental piece of evidence for understanding the local economic history. In the period between the two wars, at the foothills of Monte Fernazza – in the area of Caprile – a curious activity was being carried out. It was conneced to a subterranean cave – very particular in its origin and for the material that was being extracted: onyx. This mine has been closed for a number of years now, and it was only recently reopened; a topographic survey was executed, and an actual exploration route was devised also. The accessible cavity is constituted by a large, elongated room, parallel to the slope. The material which was being extracted was a calcareous alabaster of great quality; this lithoid (rock) material was known with the commercial name of ‘onyx’ – but it is in fact not to be confused with the homonymous mineral, which can be ascribed to chalcedony. The origin of the vein is to be looked for in the huge landslide which detached itself from the western side of Monte Fernazza. This ancient land movement involved primarily the so-called ‘Jaloclastites of Monte Fernazza' – a stratigraphic unit which has a sedimentary origin – but it is also linked to basic submarine eruptions, which happened in the Upper Ladinian (Middle Triassic). Together with the blocks of jaloclastites, this ancient landslide has also involved limestone blocks and Dolomite boulders – most likely from the upper slopes of overhanging Civetta. The circulation of fluids rich in mineral substances – mainly calcium carbonate – has allowed the precipitation of calcareous alabaster in the hollows, thus generating the mineral vein; this ‘onyx’, therefore, is a chemical deposit due to precipitation, analogous in nature and origin to cave concretions, and as such not a mineral. The enriching presence of different salts, deriving from the percolating water, has also given origin – in turn – to a series of spectacular colorations taken on by the ‘onyx’ itself. In the 1940s, the miners demanded and obtained the authorization to dig a gallery in order to follow the vein, which extended under the Cordevole riverbed. It is still possible to see the access point of this exploratory gallery, which was literally dug inside the mine, and where was also a well that unfortunately today is completely filled with water. The actual landscape of the val Fiorentina is the result of processes that have established themselves in the Dolomites after their final emersion from the sea – an event which can be dated between the end of the Oligocene and the Miocene, following the lifting up of the Alpine chain. Many agents of degradation have acted upon this territory ever since, to mould it into its actual aspect – in particular gravity, running surface water, the action of subterranean water, ice and the action of freezing-thawing cycles. The geological nature of this land, characterized by an alternation of rocks of different erodibility, has created a substrate on which – often in a selective manner – various processes have taken place; for example, those linked to gravity are manifested mainly through rock landslides and debris-flow (detritus) phenomena, which sometimes are quite showy – as it can be appreciated in the upper part of the valley. The valley itself is the result of erosive processes determined by the activity of ancient quaternary glaciers and water courses; at the end of the glaciations, it was mainly the action of surface water that acted as a moulding agent. The actual val Fiorentina shows in fact the typical ‘V-section’ of the fluvial valleys, but as we rise in altitude it takes on a typical ‘stair-like’ (Italian ‘a gradoni’) outline, which is consequence of the presence of variously erodible lithologies, due also to subsequent erosive and depositional cycles. Morphologies and deposits of glacial origin too are observable in altitude, as for instance in the area of Mondeval, which presents itself – also for the geologic nature of its substrate – as a basin characterized by soft or carved morphologies. The large Dolomite boulders that lay on top of this surface – as the famous rock connected with the Pre-historic burial of the Mondeval man – derive from the collapse of rock walls from the Lastoni di Formin, then elaborated, reshuffled and repositioned by the action of glaciers. Finally, Karstic activity manifests anywhere the carbonate rocks are being exposed, and this is particularly evident on the summit of Monte Pelmo, where the presence of Jurassic limestone and the conjoined action of ice and water have created an extraordinary glacial-Karstic landscape, dominated by the presence of showy corrosion shapes and deep vertical cavities. To Vittorino Cazzetta – to whom the museum is dedicated – we also owe a fundamental contribution for the geologic section of the Museum: his is the indication of the presence of invertebrates’ imprints on a large Dolomite boulder, collapsed at the foot of Monte Pelmetto and subsequently recognized – for the first time in Italy – as dinosaur’s imprints. These impressive finds are the main focus of this section of the Museum, as the visitor is guided through the entire geologic history of the valley, recounted in chronologic order through boards, drawings, pictures, reconstructions, rock and fossil samples, which all illustrate the modifications occurred in the area during the Triassic: the geologic period – comprised between 251 and 199 million years ago – which is by far the most documented in all of the Dolomites. A stratigraphic scheme, with a colour-coded indication of the different geologic layers to which the exhibits are referred to, is devised to assists the visitor all along the route. The most ancient rocks of the val Fiorentina belong to the Werfen Formation: a stratigraphic unit referred to the Lower Triassic (or Scitian) and widespread in the whole of the Southern Alps. This unit expresses a vast marine habitat constantly fed by fine detritic material coming from the north, and eroded by what was left of a preceding mountain chain known as ‘Ercinic’. The sediments belonging to this ancient sea are therefore mostly made of fine sandstone, siltites and micaceous limestone, and denoted by quite strong colours – such as green and red. Given its highly heterogeneous nature, this formation is subdivided into various sub-units called ‘members’ or ‘horizons’. Despite the fact that life in this sea was quite thriving, the fossils – not very widespread – are mostly represented by internal models and imprints. The more frequent mechanical traces are also given by marks left by the dominating currents (‘ripple marks’) – all in all quite similar to those that can be observed on an average beach today. Even the hychno-fossils – that is, the various marks left on the sediment by the different organisms – are relatively common: these are mainly the remains of dens and marine invertebrates’ trails, but – albeit rarely – one can also find here imprints and tracks of continental reptiles, especially on those stratigraphic layers which were clearly generated in emerged conditions. Many layers’ surfaces are sometimes covered with mollusks – especially Bivalves; amongst these, particularly significant is the presence of Claraia clarai, but decidedly more spectacular are the imprints left by sea-stars and other marine creatures. At the end of the Scitian, a sharp reduction in the supply of earth is registered, and on top of the Werfen Formation is thus being deposited a block – about 20 metres thick – of stratified (or layered) Dolomite, normally devoid of fossils. This new unit – known as Lower Serla Dolomite ('Dolomia del Serla Inferiore') – is linked to a relatively shallow marine habitat characterized by tidal plains, over-salty and therefore ill-fitting for living organisms. This formation, however, is documented only locally in the val Fiorentina, because of the complex events that denoted the subsequent Anisian plain (or level). The Anisian constitutes a crucial stage for the whole Southern Alpine range – one that modifies deeply and completely the monotonous geography of the preceding Scitian. As a matter of fact, from this moment onwards, an intense tectonic activity dismembers the region into sectors, all with different environmental and Paleo-geographic conditions: some areas are lifted to an emerged state, while others – still occupied by the sea – tend to become deeper and deeper. This determines – in turn – the fact that, even at relatively short distances, one may find rocks belonging to the same geologic era as an expression of utterly different depositional events. An extraordinary example, in this respect, is represented precisely by the small Cernera massif, which shows – in just a few kilometers from west to east – an incredible but consistent passage from riverine to lagoon-like 'facies', then coastal and finally decidedly marine habitats (‘facies’). Examining and correlating laterally the various rocks that follow one another over time, we are therefore able to reconstruct the Anisian landscape and its modifications. To the west was an emerged ridge now known as ‘Dorsale Badioto-Gardenese’, in which erosive processes were dominant; here the rivers transported large quantities of sediments towards the adjacent seas – in particular towards the area of Cadore, as the Anisian sea was extending eastwards. Because of periodical oscillations in the global marine levels, the coastline also continued to shift, thus effecting constant variations in the habitats, both in a horizontal and vertical sense, but without significant alterations in the Paleo-geography. The continental deposits contain rare and spectacular fossils; in the Voltago Conglomerate we find mostly vegetal remains, while in the Richthofen Conglomerate we can also spot imprints of ancient continental reptiles. The continental deposits fade in a characteristic way both laterally and on the top towards marine ‘facies’; at first, one finds habitats connected with coastal lagoons that gradually transition into shallow marine basins, more or less polluted by the silts coming from the mainland. The fossils present in these units are those typical of a shallow sea environment; in the deepest marine ‘facies’ we find instead a characteristic fauna dominated by Ammonioids. With the Ladinian the whole Dolomite area becomes slowly ever more profound, leading to the sinking of the preceding emerged lands. Once the mainland has distanced itself, the supply of earth also ceases, and so sedimentation acquires a decidedly less carbonate character. In those sectors that are less deep, constructor organisms can therefore become established – such as, for example, corals – thus defining very particular areas which will evolve as carbonate platforms and buildings. Despite being already present during the Anisian, it is with the Ladinian that carbonate buildings take on a spectacular form, with a thickness which can sometimes exceed 1,000 metres. The carbonate platforms – amongst which are Monte Cernera, Marmolada, Sassolungo, Catinaccio-Latemar and Sciliar – have grown apparently one on top of the other for the whole duration of the Ladinian, so to form localized, isolated bodies laying at the bottom of the basin, and surrounded by much deeper marine habitats. Sheer falls – often conserved with the original inclination, as on the northern face of Cernera and Verdal – joined up the carbonate buildings to the adjacent deep-sea beds. In the latter, sedimentation was generally reduced and given by the Buchenstein (or Livinallongo) Formation. This unit is constituted by both carbonate (bituminous and nodular) limestone and volcanic deposits; characteristic is in fact the so-called ‘Pietra Verde del Cadore’ ('Cadore Green Stone'), which surfaces quite profusely by the Belvedere at Colle Santa Lucia: this is constituted by a fine volcanic sandstone, expression of the beginning of a volcanic activity which, starting from the south, would progressively affect – in the Upper Ladinian – the whole of the Dolomites’ area. From these stratigraphic units come a few types of fossils: essentially pelagic bivalves of genus Daonella and ammonioids; the latter, in particular, are fundamental in order to define the geologic age of all Triassic units. In the Upper Ladinian another dramatic event took place: volcanism, which was to overlay itself to the complex situation that was being generated in the Dolomites’ area, whose basins were already reaching beyond 1,000 metres of depth – as documented by the Zoppé Sandstones and the Acquatona Formation. In the Dolomiti Bellunesi volcanic activity is of submarine nature, and it is given by basaltic lava, often with the typical ‘pillow’ structures (pillow-lava) and products given by submarine reshuffle (a mixture of pillow-breccia and Fernazza jaloclastites). Volcanism, which manifests itself also with the repositioning of veins and intrusive bodies – as in the Monzoni and Predazzo ranges – is accompanied by an equally intense tectonic activity, evidenced also by enormous, chaotic deposits due to great submarine landslides, provoked by faults. This happens while locally the last carbonate platforms still survive – as on the Sciliar. Elsewhere – for example on the Marmolada and on Monte Agnello by Predazzo – large volcanoes form and emerge from the sea; subsequently, once the volcanic activity ceases, their sub-aereal apparatuses are being dismantled by the erosive processes, so that enormous quantities of detritus are being formed, then transported and spread by murky currents towards the deeper basins. For a good part, the Ladinian – precisely as it is observed on the Corno Alto and at Mondeval – is represented by very powerful sequences of volcanic detritus (Wengen Formation), the latter accompanied sometimes by conglomerate 'facies' (layers of Marmolada Conglomerate). In all of these detritus’ 'facies' the fossils – never frequent – are mostly represented by pelagic Bivalves, Nautiloids and Ammonioids. Vegetal remains coming directly from the emerged volcanic areas (mostly islands) are also locally present – mostly appearing as reshaped matter, then deposited on to the sea beds. Because of the enormous quantity of volcanic-sedimentary material transported into the basins, these generally tend to slowly fill up; the same carbonate buildings also tend to become suffocated at first, and then literally buried under the detritus material of volcanic origin: spectacular examples, in that respect, can be observed precisely on the Cernera and in the Pale massif. Somehow connected with Triassic volcanism is also the widespread presence of metallic minerals, scattered a bit everywhere in the valley; these minerals, especially in the past, have played a non-negligible role in the local economy. The beginning of the Carnian doubles the preceding situation, in the sense that wherever there were platforms we will find analogous situations – in the same way as the Carnian sea rests on the Ladinian sea, but with ever lesser depths. The supply of volcanic-detritus material into the sea in fact continues in great quantities, even though the volcanic activity has by now almost completely stopped, while on the preceding carbonate buildings – at this stage devoid of life – corals start to establish themselves once again, and so do other constructor organisms, which will give origin to at least two more generations of carbonate platforms. These will present themselves as tabular bodies, less potent than the preceding Ladinian buildings, but much more extended in terms of area. The new plateaus are indicated with the name of Cassian Platforms (or 'Dolomite Cassiana') and will tend to expand laterally at the expense of the adjacent basins, which are being progressively filled up. The Coldai range, the complex that goes from the Gusela del Giau to the Averau/Nuvolau massifs, and most of the Sella group, are only some of the major examples of Carnian platforms. The relative stability of the marine levels hinders the accumulation of further sediments above the same platforms, so that the settled sediment produced by the platform can only be deposited at the margins of the same structures, inclined towards the sea, and this determines their ongoing centrifugal expansion. The buildings at the margin of the Cassian Platforms – perfectly still visible today – are in fact given by layers tilted towards the exterior, along the periphery. The situation of these basins is in fact not much different from the preceding one: they are still subjected to the constant supply of volcanic-detritus materials, but also the platforms themselves are starting to discharge sediments into the basin. Sometimes gigantic blocks would detach themselves from the edge of the platform, roll along the slope to then finally collide with the underlying mud and sands of the adjacent basins; one of these spectacular blocks – known as ‘Calcare di Cipit’ – can be observed at Passo Sella. The depositional basins dating to the same age as the Cassian Platforms are therefore being gathered into one quite well-known stratigraphic unit: the San Cassiano Formation. This unit is universally known for the extraordinary richness in fossils it contains, constituted by both those organisms which used to live in the basin and the re-deposited ones: sponges; many types of corals; Brachiopods; Gasteropods, sometimes even with traces of colour; Bivalves; Cephalopods; Echinoids; Crinoids; rests of vertebrates, amongst which – in particular – are the Placodonts. At the beginning of the Upper Carnian the marine basins are in the process of being filled up, so that not even the Cassian Platforms have enough space where to expand; therefore, the aspect of the Dolomites changes again, and it is now characterized by great, rather flat extensions that develop at water level, from which even vaster emerged lands arise, flanked by canals and deep-sea stretches. Once the earth supplies stop, various types of sediments start to deposit on these environments, part of the Heiligkreutz Formation, which comprise both continental/lagoon-type detritus’ deposits and Dolomites’ ‘facies’ typical of the tidal plains. Locally – as at the foothills of the Tofane – the detritus’ ‘facies’ produce very rich associations in which mollusks are prevailing, but there is also a presence of Nautiloids and of vegetal rests, amongst which are amber drops, bone fragments and reptiles’ tooth – both marine and terrestrial. The presence of continental reptiles during the deposition of the Heiligkreutz Formation – but also in the internal plains of the pre-dating Cassian Dolomites – is an established fact by now. On the surface of many boulders, which have precipitated from the Dolomite rock walls that encircle the Mondeval basin – but also on the Dolomite of the tidal plains, which is being exposed in several locations (Rocchette, Formin, Settsass) – imprints of large invertebrates have been identified. Certain data for a more definitive interpretation are still missing, but already at this stage it can be asserted that the Carnian tidal plains were being roamed by several types of Arcosaurus reptiles, and perhaps even by primitive dinosaurs. In the Upper Carnian a global event of great importance involves the Dolomites: a rapid and powerful lowering of the sea beds, which determines the definitive retreat of the sea. The entire complex of the Southern Alps – by now emerged – is at first flattened by degradation agents and then – here and there – covered again by new, ‘clastic’ sediments, which are being abandoned by the many water courses that still cut through the region. Quite warm and arid climatic conditions then determine the formation of epehemeral evaporitic basins, in which chalks are being deposited – and this also accounts for the generally red colour of the deposits, which is to be ascribed to these peculiar environmental conditions. The whole set of these deposits – which ultimately result quite poor in fossil remains – is to be indicated in the Dolomites with the name of Travenanzes Formation. At the end of the Carnian the region presented itself as an immense plain, stretching from west to east as far as the eye could see. It is at this time that the sea starts to rise again, thus transforming this almost desert-like environment into a tidal plain. With the latter is to be intended a roughly flat area which is subjected to cyclical advancements and withdrawals of the sea; this mechanism can be compared to tide cycles, but – because of astronomical factors – it is of millennial duration. The position of the Dolomites within the Tropical climatic band – at this particular point in time – allows to compare the environment that we have just described with the one still existing today in locations such as the Caribbean or the Persian Gulf – but none other is more similar to the Dolomites of the origins than present-day Bahamas archipelago. This situation is going to persist – roughly unchanged – for an extraordinarily long geologic time; in actual facts, until the end of the Triassic – thus including the Norian and Rhaetian levels. The consequence of a similar evolution is the accumulation of layers of enormous thickness (up to 1,500 metres) of apparently monotonous rocks, which will go to constitute the backbone of the Southern Alps. It is not by chance that the main rock formation of which we are talking about here is called Main Dolomite (‘Dolomia Principale’): the Croda da Lago, Pelmo, Tofane and Civetta, as well as many other mountains of the Dolomites – but also of the Pre-Alps of Veneto and Lombardy – are in fact modeled into this rock unit. The monotony of these layers is only apparent, however: observing them with the eyes of a geologist, it is in fact possible to recognize in the layers the succession of different environments, and their adaptation to constant variations in the sea level. In a nutshell, the tidal plain of the Main Dolomite was constantly moving from conditions of shallow-sea levels (sub-tidal conditions) to emerged conditions (supra-tidal), passing through an intermediate phase controlled by oscillations in the tides (inter-tidal conditions). The sub-tidal marine environment is characterized by massive Dolomite ‘facies’ in which are frequently found imprints and the internal models of mollusks – such as Megalodonts. When the sea retreated, the tidal plain would become covered by carpets (or mats) of algaes and cyanobacteria, capable of trapping the sediment and thus forming thin laminations known as ‘stromatolites’. These ‘facies’ are devoid of fossil remains, but it is within this context that has to be set the important discovery of the boulder leaning against the base of Pelmetto, which has unexpectedly revealed the presence of dinosaurs’ imprints. To the curiosity of Vittorino Cazzetta we owe the individuation – in the early 1980s – of the Main Dolomite boulder lying at the foot of Pelmetto, with strange and mysterious lines made of holes. That boulder – now become famous – has allowed to document in an undisputable way, for the first time, the presence of dinosaurs over the Italian territory. The analysis of the surface (almost 40 sq m) offers convincing and thrilling details: the surface shows a series of at least 100 holes, mostly arranged in regular successions and imprinted in a thick layer of ‘stromatolite’ veins, deformed and squeezed. Obviously the holes are just imprints, while the regular successions are proper tracks; one in particular crosses diagonally and in a spectacular fashion the entire surface. The individual imprints are placed quite regularly, with a constant angle; they are symmetrical when compared to the tracks’ axis – exactly as a two-legged animal would proceed. If we observe the single imprints within this track, we will notice that they are surrounded by a typical swelling: that is mud, still plastic and soaked with water, expelled by the weight of the animal – mud that is by now lithified (that is, it has become rock), as in fact the entire surface which had been walked upon by these Triassic giants, ascribable to the Upper Carnian-Lower (or Basal) Norian. But what sort of dinosaurs where these? The most evident track is ascribable to a primitive Ornitiscus: a small herbivore dinosaur, which left imprints – no more than about 12 cm long – with its posterior legs. The greater part of the smaller imprints – often lined up as in a trail, and dispersed on the boulder’s surface – belongs instead to small carnivorous two-footed dinosaurs, ascribable to genus Ceratosaurus, about 1,5 m long and no more than 1 m tall. But there is yet another track – ill-preserved on the boulder’s margins – which is constituted by circular imprints (about 15 cm in diameter), accompanied at times by even smaller imprints. This track – evidently of a four-footed creature – is to be referred to a type of herbivore dinosaur almost 4 metres long – a relative of the more famous Brontosaurus. A reconstruction allows to visualize the situation as it was in the Dolomites 215 million years ago. After the original report by Vittorino Cazzetta, the boulder was examined for the first time in 1985; then, shortly after that, the first evidence of the presence of dinosaurs in Italy was announced. Provisional casts of the imprints were taken, and the entire surface reproduced, with the final goal of executing the complete cast – as it is now being exhibited in the Museum. Since the first report of dinosaurs’ imprints conserved on the Dolomite boulder at Pelmetto, other locations within the Southern Alps have produced new data in order to recognize and list the totality of terrestrial vertebrates that, between the Upper Carnian and until the end of the Triassic, populated the Main Dolomite tidal plains. Some sites have already been studied, while for others (such as the Moiazza and Civetta) research is still under way. Besides the main Dolomite boulder at Pelmetto described above – which conserves about 100 imprints referable to dinosaurs – further examination of the scree deposits has revealed a certain number of other imprints, which widens considerably the knowledge on the fauna of the time. From this analysis one can in fact document the presence of Saurians, of genus Ornitiscus and of small Arcosaurus. The Saurians are represented by small imprints – organized in two-legged trails – of Teropods ascribable to small carnivorous dinosaurs (Ceratosaurus), similar to genus Coelophysis. There are also a few three-toed imprints of bigger dimension, ascribable to genus Eubrontes, which are larger Ceratosaurus. The Saurians are also documented by a single four-footed track, ascribable to a herbivore creature – and so are the basal Ornitiscus, whose trail provides the most suggestive evidence of all on the boulder. Together with the dinosaurs’ imprints, isolated marks and a track of Arcosaurus reptiles – referable to the so-called Tecodonts – were also individuated. The stratigraphic position allows to attribute the entire association to the Upper Carnian or Lower (Basal) Norian. Once the last huge glacial expansion ended, the environmental situation of the Alps moved towards conditions that are more similar to the present ones. As a consequence of the rapid withdrawal of the glaciers, the mountain was colonized again by vegetation and animals. Even man – Homo sapiens, that is – adapted to the meaningful changes that characterized this period: in the regions of North-east Italy, as the climatic conditions improved, man progressively started to climb further up in altitude. At the beginning, it was question of small groups (25-30 people), who migrated towards the interior of a definite territory, moving ever higher from the valley floors towards the highlands during the good season. Their economy was exclusively based on hunting, fishing and the gathering of wild products. Started during the last phases of the Upper Paleolithic (recent Epigravettian), this progressive process of colonization of the Alpine territories became more decidedly established during the Mesolithic – a cultural phase that begins at the end of the Late Glacial (around 11,600 years ago) and terminates in the period in which one starts to register the spread of forms of economy linked to agricultural and livestock farming, which will characterize the Neolithic (6th century AC in Northern Italy) and affect also the first part of so-called Holocene (or Post-Glacial). The Mesolithic in Northern Italy is articulated into two phases: a more ancient one, – known as Sauveterrian – and another more recent, called Castelnovian. Among the several hundred Mesolithic sites in high altitude known in the South-eastern Alps – at altitudes comprised between 1,900 and 2,300 metres – that of Mondeval de Sora is the most important for conservation, quality and quantity of the finds. The so-called ‘Site 1’ at Mondeval de Sora is situated at the centre of the basin bearing the same name, in correspondence with a large, isolated Dolomite boulder, at an altitude of about 2,150 metres. First discovered in 1985 by Vittorino Cazzetta, the site has been the object of research for over 15 years, allowing to bring to light two different archaeological deposits, respectively located under the two protruding sides of a large erratic Dolomite boulder. The first frequentation dates to the most ancient phase of the Mesolithic – that is, the Sauveterrian: an epoch during which the site is also affected by the presence of a settlement leaning against the boulder’s walls. In this period, in the area opposite the boulder and up until the margin of the small basin, was located a small lake, delimited by a cordon of moraines (small ondulations). To the subsequent and more recent Mesolithic phase (Castelnovian) are to be ascribed the burial of a hunter, accompanied by a rich funerary endowment and some further traces of a settlement. After a period of apparent abandonment lasted for a few millennia, the site became inhabited again during the Bronze Age – an epoch to which are dated some combustion structures, such as a furnace, and the base of a hut. During the Late Ancient Roman Age a new phase of occupation is registered, attested by the recovery of two Roman coins, which carry respectively the effigies of Emperor Constance 2nd and Teodosius 1st (6th century DC). In the successive epochs, the great erratic boulder that dominates the basin continues to constitute a reference point for the communities of shepherds that roam the area – at least until the construction of the actual ‘malga’ at Mondeval de Sora; this fact is also witnessed by the basal portions of structures in dry-stone, dating to historic times, that were discovered against the rock's walls. Delimited by an imposing relief and linked to the surrounding valleys by passes and ‘forcelle’, the clearing at Mondeval de Sora has long represented a strong reference point for the groups of Mesolithic hunter-gatherers roaming these uplands: this is due to its rather strategic position, in a transitional band between woodland and Alpine meadows/pastures. In the course of about 20 years of research, the finding of artifacts in chipped stone and – more rarely – of fauna remains, has allowed the archaeologists to identify several sites which can be ascribed to this period, located in recurring positions. On the one hand, the presence of flatter areas – situated in proximity of water courses, small pools and/or erratic boulders – has favoured the establishment of temporary settlements, used also as base camps for all other movements over the land. On the other hand, the areas located in correspondence of passes, ‘forcelle’ and vantage points – often along transit routes – have been used as brief stopping stations or as hunting posts. The study of evidence found in different sites within the basin allows also to affirm that frequentation of the area started with the most ancient phase of the Mesolithic – that is, the Sauveterrian, characterized by the presence of lithic (rock) instruments of small dimensions (armors ), dominated by triangular shapes and tapered points persisting through to the most recent phase (Castelnovian), when trapezoid-shaped armors start to become established and more widespread. The Mesolithic hunter-gatherers practiced a nomadic life-style, moving from area to area according to a seasonal yearly rhythm and in relation to the availability of resources. The study of the provenance of rocks used for fashioning utensils represents an important means in order to reconstruct their movements across the land. In Mondeval, during the ancient phase of the Mesolithic (Sauveterrian), the use of flint of Pre-Alpine origin is largely documented; this material was, most likely, introduced to the area from the middle Piave Valley (val Belluna). It is therefore possible to hypothesize that, in order to reach these territories during the most favourable times of the year, these groups of hunters followed the routes on the valley floors, along the water courses – mainly the Piave and its tributaries. In the most recent phase of the Mesolithic (Castelnovian) it can be observed, however, a clear change in the area used for the provision of supplies, which is evidence of the fact that the groups coming to Mondeval were now gravitating more on the Adige Valley (Val d’Adige) rather than the Piave Valley. Besides these rocks, in each of these phases it was used – even though with lesser frequence – also a local variety of flint, probably quite widespread in the area of the Dolomites. Extremely interesting for the reconstruction of the mobility of the Mesolithic groups is also the recovery of a small marine shell (Columbella rustica), used for ornamental purposes, which seems to suggest movements towards the sea or – alternatively – exchanges with other groups settled in the area around the Northern Adriatic coast. Another material, present within this site and which could give indications on the mobility in the area, is ochre – a compound obtained from iron dioxide and used both as a colouring as well as for the execution of various tasks. However, at the moment, a specific study that indicates the provenance of this material is not available as yet. The majority of instruments and tools used by the Mesolithic hunters which have reached us in good conditions is constituted of artifacts in chipped stone. The operations linked to the confectioning of these objects started with the extraction of small sharp splinters of elongated shape (lamellae), obtained out of flint nodules which were being hit using different techniques. During the Sauveterrian, the use of direct percussion was quite exclusive (it was generally achieved with the help of a small stone), while during the Castelnovian a more sophisticated technique known as ‘indirect percussion’ started to be employed, which made use of intermediate elements – a sort of chisel placed between the ‘percussor’ and the nodule which had to be chipped away at, thus favouring the extraction of more regular lamellae. Some lamellae, thus obtained, were then further segmented in more parts with a particular procedure (the micro-burin technique) and evened with small blows at the margins, with the aim of obtaining artifacts of different shapes: pointed armors and triangles in the Sauveterrian and trapezoid armors in the Castelnovian. These artifacts of very small dimensions – often inferior to 1 cm – were subsequently mounted on wooden sticks or other supports to confection arrows, light javelins or other more complex tools. Other lamellae, kept unpolished, were instead directly employed for the cutting of soft materials or for working wood; besides, the sturdier splinters and the same lamellae were also being modified along the margins in order to obtain various tools, used for the execution of different activities linked with sustenance. Quite frequent are also the ‘scratchers’ that were being used for leather tanning – an operation which was carried out with the aid of abrasive and degreasing substances such as ochre. The majority of Mesolithic instruments and tools in stone must therefore have been endowed with handles – or mounted on supports with the assistence of resins or rough tiers, which in most cases have unfortunately been lost. In some rare cases, however, a few tools obtained out of the manufacturing of hard animal materials were conserved. The sustenance of Mesolithic populations depended strictly on the varying resources according to the rhythm of the seasons, and – therefore – the different environments occupied during the course of the year. However, the limited capacity of conservation in regards to remains of organic nature only allows us to have direct evidence on the consumption of a rather limited range of resources, when compared to the ones actually used (which are almost impossible to document today in their entirety). Amongst these, a particularly essential role was played by animal resources, whose evidence in Mondeval consists of bone remains of hunted preys. The localization of the site in proximity of the upper limit of woodland – which at the time must have been located at a slightly higher altitude in respect to the current one – allowed the hunters to get hold of both preys that inhabited the woodland (as for instance deer, which during the summer travel higher up in altitude) and those that, on the contrary, lived in the Alpine pastures and meadows – such as ibex, chamois and marmot. The exploitation of carcasses was also mainly finalized to obtain alimentary resources: meat, marrow and organs – either used directly or subjected to conservation processes. The study of the bone remains has allowed researchers to identify the traces of the different activities carried out – mostly thanks to the presence of marks and fractures executed in order to remove the meat or obtain the marrow. Bones, skins and sinews could also be used to fashion other various tools indispensable for sustenance. These latter instruments would include axes, bradawls, points and so on. Unfortunately, there is no direct trace of the use of vegetal resources that also must have been quite varied (mushrooms, fruits and berries, herbs, etc) and probably carried out an essential role in diet and daily life. The first burials known in Europe date to the Upper Paleolithic (40,000 – 11,5000 years ago). These have reached us in extremely reduced numbers, and the same can be said for the Mesolithic: it is therefore possible that only a few individuals were being buried, but it is difficult to understand the reasons behind this choice; neither do we know which type of treatment was reserved to the other members of the group. All the Paleolithic and Mesolithic burials have been discovered within sites that have also returned traces of settlements. The burial at Mondeval de Sora is the highest in Europe and it can be referred to the Castelnovian phase (about 7,500 years ago). It is constituted by a ditch inside which the buried person was laid supine with distended limbs; the inferior part of the body was covered in stones. The skeleton is ascribable to a male adult of circa 40 years of age, about 1,70 m tall. The objects that accompanied the deceased – found inside the burial ground – are numerous and of various typologies. Some accompanying objects appear strictly connected to the funerary rite – as for instance the three blades manufactured in yellow flint, and placed respectively on the head and behind the shoulders, whose meaning remains obscure. A bradawl, manufactured in elk bone, was placed on the sternum, while another one – worked out of deer bone – was located between the knees instead; probably, these were being used in order to seal off the leather shroud inside which the body of the hunter was wrapped. Other elements that accompanied the buried person make a reference to the ornaments that the hunter must have worn at the time of the burial. These are seven canines belonging to deer, all of them with a hole – which make one suggest they were all strung together in a chain. On the left side of the buried hunter – at the height of the lower arm and hand – three groups of objects have been found which, most likely, were contained within three bags. Besides those objects in flint, there were also some artifacts manufactured in bone or out of deer antlers, which give us a rare picture of the kit of utensils that a Mesolithic hunter must have carried with him.